Definition at line 347 of file ntpoapi.h. Definition at line 377 of file ntpoapi.h. Definition at line 359 of file ntpoapi.h. Definition at line 375 of file ntpoapi.h. Definition at line 376 of file ntpoapi.h. Definition at line 381 of file ntpoapi.h. Definition at line 372 of file ntpoapi.h. Definition at line 369 of file ntpoapi.h. Definition at line 357 of file ntpoapi.h. Definition at line 356 of file ntpoapi.h. Referenced by Adv_InitDialog(), CheckPowerActionPolicy(), FixSystemPowerState(), Hib_InitDialog(), IsPwrHibernateAllowed(), and Pos_InitData(). Definition at line 350 of file ntpoapi.h. Definition at line 380 of file ntpoapi.h. Definition at line 348 of file ntpoapi.h. Referenced by Adv_InitDialog(), and PopAddRemoveSysCapsCallback(). Definition at line 368 of file ntpoapi.h. Definition at line 363 of file ntpoapi.h. Definition at line 362 of file ntpoapi.h. Definition at line 379 of file ntpoapi.h. Definition at line 349 of file ntpoapi.h. Definition at line 378 of file ntpoapi.h. Definition at line 370 of file ntpoapi.h. Definition at line 373 of file ntpoapi.h. Definition at line 374 of file ntpoapi.h. Referenced by Adv_InitDialog(), Applet1(), and Pos_InitData(). Definition at line 351 of file ntpoapi.h. Referenced by Adv_InitDialog(), CheckPowerActionPolicy(), FixSystemPowerState(), IsPwrSuspendAllowed(), Pos_InitData(), and ValidatePowerPolicies(). Definition at line 352 of file ntpoapi.h. Definition at line 353 of file ntpoapi.h. Definition at line 354 of file ntpoapi.h. 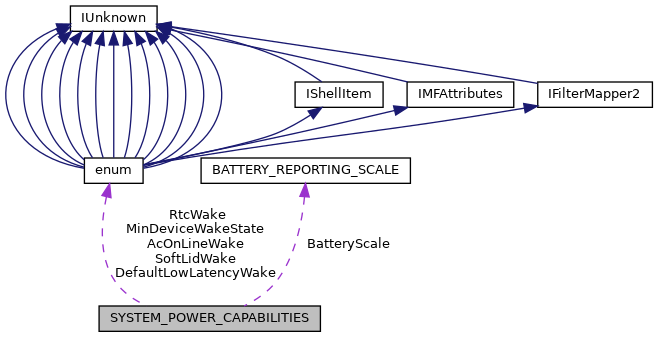 Referenced by CheckPowerActionPolicy(), FixSystemPowerState(), IsPwrHibernateAllowed(), and ValidatePowerPolicies(). Definition at line 355 of file ntpoapi.h. Referenced by Adv_InitDialog(), IsPwrShutdownAllowed(), and PoInitSystem(). Definition at line 361 of file ntpoapi.h. Definition at line 360 of file ntpoapi.h. Definition at line 358 of file ntpoapi.h.